In the past, when a person wanted to invest in silver, the only way to do it was to own physical silver bullion bars. Nowadays, many more investment options are available. Paper investment allows you to own large quantities of silver without amassing a huge stockpile in your house. With paper certificates, or accounts, you do not need to worry about storing your silver. Certificates are issued by governments and national banks, and so are reputable and highly liquid. Different types of accounts include allocated accounts, pool allocated accounts, and pool unallocated accounts. Allocated accounts are straightforward. The paper certificate you hold states that that you own a certain amount of silver, and that the bank has allocated that silver and is holding it in your name. It also mentions what physical form your silver is in, be it bars, coins, or rounds. All details, including the brand of silver bullion, are listed so when you choose to redeem your certificate, you receive the exact amount and type of silver that you paid for. All the bank does is safely store your assets for you. Fees associated with allocated accounts are storage fees to the bank and a one-time fee to purchase the certificate. However, you are not obligated to pay sales tax on certificates, as you would if you were purchasing physical silver. A variation of this is a pool allocated account which states how much silver you are entitled to, but does not state the physical form that silver takes. Fees to be paid on pool allocated accounts are storage fees as well as shipping fees if you ever want to extract your silver. However, the fees are typically lower than those associated with allocated accounts. With allocated accounts, the silver you own is in reserve and the bank cannot touch it. Whenever you are ready to have it delivered to you, it is there and can be shipped immediately. Pool unallocated accounts operate slightly differently. While you do have your silver stored with the company, it is not allocated specifically for you. Instead all the silver the company handles is pooled together and they are free to do what they would like with their collective stores of silver. 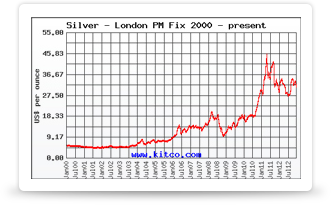 What can happen in a pooled unallocated account is that if too many investors are requesting shipment of their silver at one point, the trust may not have your amount of silver in stock and ready to ship to you. This is called a “run”. There is no storage fee for this type of account, and fees are much cheaper than allocated accounts. However, you do face the possibility of a run. Regardless of the potential risk of runs, these accounts remain among the most popular account types chosen by investors. Perth Mint Certification Program is the only Government-guaranteed precious metal accumulation program in the world. It received an AAA rating from Standard and Poor’s, so you know your investment is extremely secure. Both allocated and unallocated accounts are offered at PMCP. Allocated accounts work by providing you with title to a certain amount of silver in PMCP’s Australia-based facility. You don’t pay for duties but pay fabrication and storage costs. If you have an unallocated account then later decide you’d prefer an allocated account, you are able to convert your account type easily. In addition to the government guarantee, what makes PMCP competitive is that all of the metal they hold in trust is fully insured at no cost to you.